Archaeologists banned from referring to ancient humanoids as "hobbits"
Homo floresiensis likely stood about 3'6", making this prehistoric human roughly the average height of one of J.R.R. Tolkien's Hobbits. For years, Flores Man has been referred to by the nickname "hobbit," contributing to the species' popularity. 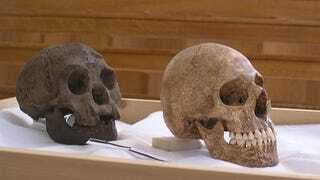 But one company that owns film rights in The Hobbit has decided that the archaeologists who discovered Homo floresiensis cannot refer to the ancient human by that name. The Guardian reports that Dr Brent Alloway, associate professor at Victoria University, is planning a free lecture on Homo floresiensis by Mike Morwood and Thomas Sutikna, two of the archaeologists who discovered the species. But when Alloway approached the Saul Zaentz Company/Middle-earth Enterprises, which owns rights in the film, for permission to title the lecture, "The Other Hobbit," their lawyer responded that "it is not possible for our client to allow generic use of the trade mark HOBBIT." The Tolkien Estate, which owns registered trademarks on the word "Hobbit" in several companies, was not approached. On the one hand, I can see a company that has a trademark interest in the word "hobbit" worrying about that word becoming generic. And Alloway acknowledges that he organized the lecture specifically to coincide with the release of The Hobbit film and capitalize on the name. But Alloway and his fellow scientists are clearly using the word in a different market-scientific, rather than storytelling-and the very fact that they call it "The Other Hobbit" acknowledges Tolkien's invention of the word. But regardless of whether the Saul Zaentz Company is legally obligated to protect its trademark interest in the word "hobbit," it strikes me that this conflict could have had a very simple resolution. The company could have licensed the use of the word to the lecture organizers for a nominal fee. Even without the company's blessing, however, Homo floresiensis remains a "hobbit" in much scientific literature-and in our hearts. Photo: Cast of Homo floresiensis compared to a microcephalic skull by Avandergeer from Wikimedia Commons.